With the continued runaway success of the box-office juggernaut that is the Marvel Cinematic Universe (MCU), it becomes more and more preposterous just how strange and unique it can be. You would think a mega-franchise this valuable would be more prone to playing it safe, hiring established visual stylists who can produce product. Instead, the MCU finds interesting creative voices that can succeed within their very big sandbox. Enter New Zealand actor and quirky director Taika Waititi (What We Do in the Shadows), one of the most surprising directorial hires in a decade of blockbusters. The Thor movies are generally considered some of the weakest films in the MCU, so there’s already plenty of room for improvement. With Waititi, Thor: Ragnarok is easily the best Thor movie and one of the funniest to date for the MCU. It’s finally a Thor movie that embraces its silly, campy, ridiculous world and finds space to cram in more eccentricity. Thor (Chris Hemsworth) has returned to his homeworld of Asgard to find it in great peril. His brother Loki (Tom Hiddleston) has been ruling in their father’s stead, and that’s not even the worst part. Thor’s heretofore-unannounced older sister Hera (Cate Blanchett) has been unleashed from her prison and is seeking the throne she feels is rightfully hers. She is the goddess of death and chafes at Asgard’s revisionist history, trying to paint over its history as conquerors for something kinder and gentler. Thor is banished to an outlying planet, Sakaar, that’s essentially a junkyard for the universe. He’s captured by Valkyrie (Tessa Thompson) and sold to fight in the Grandmaster’s (Jeff Goldblum) arena. Thor is trained to fight in gladiatorial combat, and his opponent and reigning champion is none other than the Hulk a.k.a. Bruce Banner’s (Mark Ruffalo) alter ego. Thor must break free, convince the Hulk for help, get off this planet, and save Asgard before it’s too late. Waititi has acclimated himself extremely well in the large-scale world of blockbuster filmmaking, and yet his signature quirky sense of style and humor are still evident throughout, making Ragnarok the best Thor film. Let’s face it, the Thor films are completely ridiculous and trying to treat them as anything but is wasted effort. These movies involve alien Norse gods traveling by rainbow bridges and even though they can traverse the cosmos in spaceships they still sling giant broadswords. The more the films embrace the inherent silliness of the series the better. 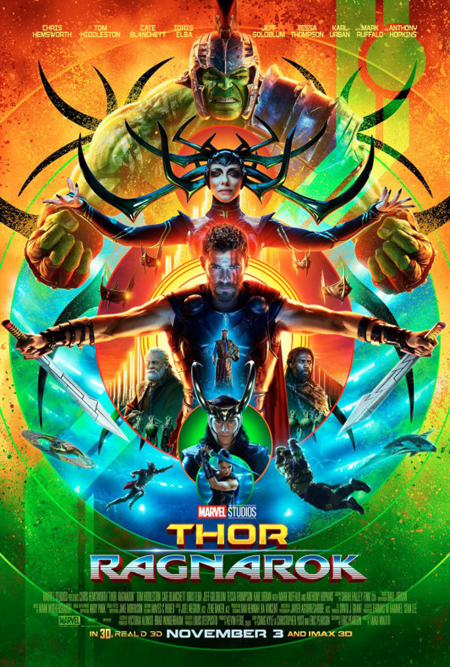 Ragnarok is the Thor movie that gets all the serious stuff out of the way in the first act, tying up loose ends from 2013’s Dark World, checking in with Anthony Hopkins’ Odin and the requisite MCU cameo (a superfluous Doctor Strange), and then introducing Thor’s long-lost twisted sister. From Blanchett’s intro, the movie becomes what it was set out to be, a lavish and consistently funny buddy comedy. Gone are all the Earthly constraints from the prior two films. It’s all aliens from here on out. Thor has everything stripped from him, his hammer, his family, his hair, and becomes an underdog once again. It’s a surefire way to make a living god more relatable. Fighting from the ground up, Thor makes all sorts of new friends and enemies, and it’s this evolution into an ensemble comedy where Waititi’s film shines. There’s a jovial touch to the world-building that extends from the visuals to the variety of odd characters. Thor has never been more entertaining as Hemsworth (Ghostbusters) is able to stop being so serious and embrace his underutilized comedic chops. The man has a stunning sense of comedic delivery and a dry wit that’s right at home for Waititi. Hemsworth and his daffy sense of humor have never been better in the MCU. Even with the added comic refinery, Thor is still the most boring of the Avengers, so Ragnarok solves this by introducing a new bevy of side characters that steal the show. The wacky world of the Thor universe was always its best aspect, and each new film pushes the boundaries a little further out, revealing more weird and wild planets and creatures. It feels like a Star Wars where we spend our time with the weird, scuzzy part of the universe. Ragnarok pushes those boundaries the furthest yet and introduces an entire cadre of loveable supporting players that you want to spend more time with. Tessa Thompson has a wonderful and intimidating introduction as she swoops in on a spaceship, makes her badass claim of her prized bounty, and then trips and falls, as she is quite tipsy from drinking. She regains her literal footing and still seems a bit out of it, but the ensuring process she goes through to claim what is hers is thoroughly impressive. As a Valkyrie, this is one tough woman, and Thompson (Creed) has great fun playing bad. She really reminded me of a female Han Solo. Thompson has a wily screwball chemistry with Hemsworth, and both actors elevate the other with lively give-and-take. Thompson is a terrific new addition. She has an enticing, irascible appeal without overt sexualization that sometimes befalls the Marvel female sidekicks (Black Widow, Pepper Potts). Another character you’ll fall in love with is Korg, a rock monster gladiator played in motion-capture and drolly voiced by director Waititi himself. My question: is it possible for a director to steal his own movie? This is a character that feels stripped from one of Waititi’s dry, absurdist comedies and placed into the MCU. Korg is a would-be revolutionary but really he’s a joke machine and just about every line is gold. By the end of the movie, I needed a Korg spin-off series to further explore this unusual character. The requisite villains of the film definitely play their roles to full camp, enjoying every moment. Blanchett (Carol) is like a Gothic Joan Crawford, marching with a slinky step and a sneer. Her multi-antler helmet completes the operatic sweep of the character. You’ll forgive me for my above comment on recognizing female characters independent of their sexuality, but man oh man does Goth Blanchett make me happy (especially with her hair down). It’s a shame that the movie doesn’t really know what to do with Hela though. Every time we cut back to her I found myself getting somewhat impatient. I wanted to return back to the weird and wild world Thor was on. Blanchett is entertaining but her character can’t help but feel a bit shoehorned in (“Hey, you had a long-lost sister, and oh by the way, she’s basically Death itself, and she’s coming by to retake everything, so have fun with that and sorry for the short notice”). Goldblum (Independence Day: Resurgence) is left to his Goldblum devices and it’s everything you would want. His signature stuttering deadpan is just as potent in the MCU, and the film finds strange little asides for him to make him even more entertaining. Karl Urban (Star Trek Beyond) has a plum role as Hela’s second-in-command who doesn’t really want the job. They actually gave this guy a character arc. It’s simple, sure, but it was more than I was expecting. Ragnarok is a swan dive into a stylized, candy-colored explosion of 80s album covers come alive. The visuals and action feel inspired as much from the art of Jack Kirby as they do the pages of Heavy Metal. The overwhelming feel is one of irresistible fun, something you lean back, soak up, and smile from ear to ear in between handfuls of popcorn. The final battle feels suitably climactic and revisits Led Zeppelin’s immortal “Immigrant Song” once the action peaks, coalescing into a crescendo of cool. The trinkly 80s synth score from Mark Mothersbaugh (The Lego Movie) is fantastic and helps to achieve an extra kitschy kick. This movie is just flat-out fun throughout. It finds fun things for the characters to do, like when Banner has to not Hulk out on an alien world filled with stressors to trigger such an occurrence. That sequence almost feels like the grown-up, polished version of Adam West desperately running around as TV’s Batman in need of trying to find a place to dispose of a lit bomb. There’s an archness to the action and character interactions that is playful without being obnoxiously glib. I also enjoyed a climax that involved more than just out-punching the villains. Some might even charitably read it as a commentary on the over-reliance of apocalyptic grandeur. 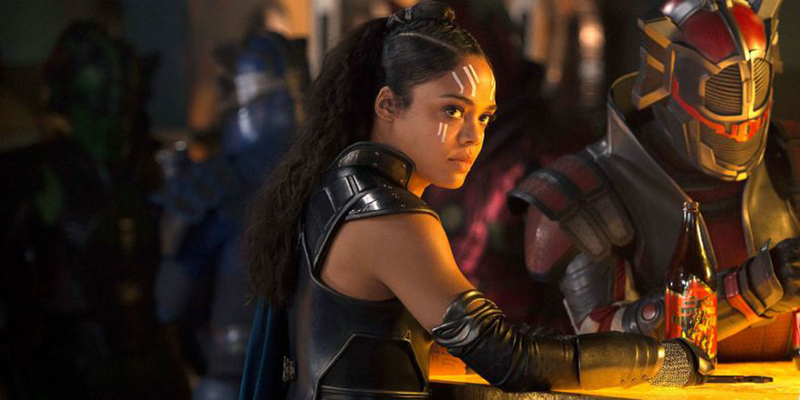 Playing from behind because of its hero’s limitations, Thor: Ragnarok finally embraces the silliness of its franchise, opening up more comic channels and vastly improving its entertainment quotient. The weird word and its collection of odd and oddly compelling characters is the best feature, and though it takes Ragnarok a bit of time for house cleaning, it becomes a steadily amusing big-budget blockbuster that maintains a cracked and lively sense of humor. It’s allowed to be strange and silly and campy. Waititi’s imaginative voice is still very present throughout the film, pushing the movie into fun and funny directions while still delivering the sci-fi action spectacle we’ve come to expect from the MCU. Ragnarok isn’t as deep as Civil War, as perfectly structured as Homecoming, or as subversive and different as Guardians of the Galaxy, but with a droll creative mind like Waititi, it becomes about the best possible Thor movie it can be.